This morning Carel decided to make me breakfast, and we decided on pancakes and bacon. I’d brought some maple syrup from the States (though someone in TSA stole one of the two bottles. May they choke on it!) and he got some locally milled pancake mix, and Spanish bacon. When he served up, I started to giggle. He made pancakes and bacon alright, but absolutely not what this American girl expected: I was expecting to see pancakes and bacon, and was served pancakes with bacon. However different from my imagination it was, it was also very tasty, and with some syrup on it – divine. 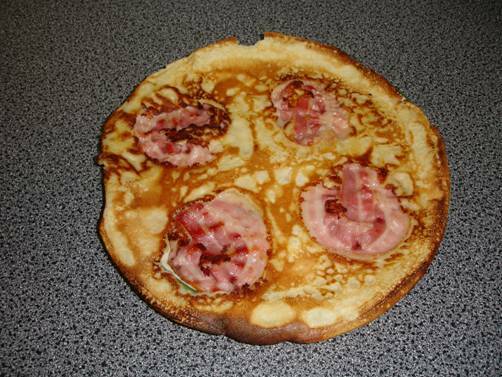 We have some mix left, so tomorrow I’m going to make him the US version of pancakes and bacon, though I wont be making classic pancakes because a) I don’t like them much and b) I don’t have the ingredients. So…it will be an American pancake breakfast with a French twist, because I like crepes. Ivo brought some chocolate paste that he made, last time he visited – dark chocolate cooked with butter and condensed milk. It will be fabulous with the pancakes. Now we are off to see what other oddities I can collect, and tonight there will be a music festival downtown. I can’t wait to see what happens next. This entry was posted on August 21, 2010 by Coyote. It was filed under dining, observations, photography .